The Client Folders feature was created for companies that perform more than one business transaction with the same client. It's very easy to use, and extremely helpful to understand where you're at with a client and their importance for your company at any given time. Tip: At no crm.io we don't want you to waste time filling in useless information. Only create a Client Folder if you perform at least 2 business transactions with the same client. How to create client folders? To create a client folder, you simply need to duplicate an existing lead. The system will "force" you to create a client folder, in which you will have all the leads with the same customer. Another way of creating a Client Folder is of course from the Client Folder menu, accessible from the left sidebar. Simply click on "New Client Folder". 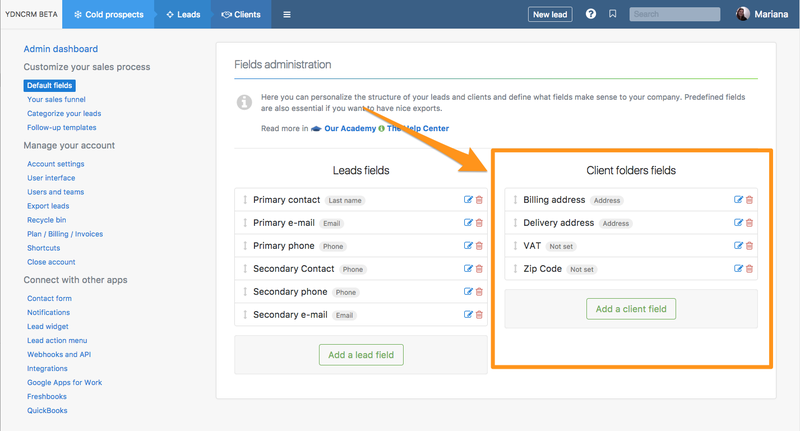 Client folders have their own predefined fields that you can set in the Admin section of your account. How to manage client folders? Managing your client folders is quite easy. 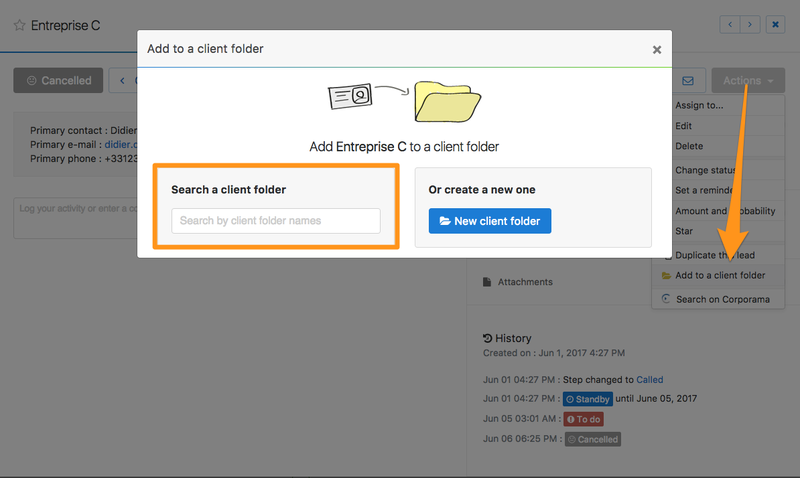 When you're in the Client Folder section of your account, you will have a complete overview of your client folders. You easily know how many leads are in each folder, their statuses, value and owners. If you have lost a customer, you can choose to deactivate their client folder in your account. Once you open a specific Client Folder, you will see the different leads that you manage or have managed with that customer. On the right, you will be able to know for how long you've been working with that customer, how much money you've made with them, etc. 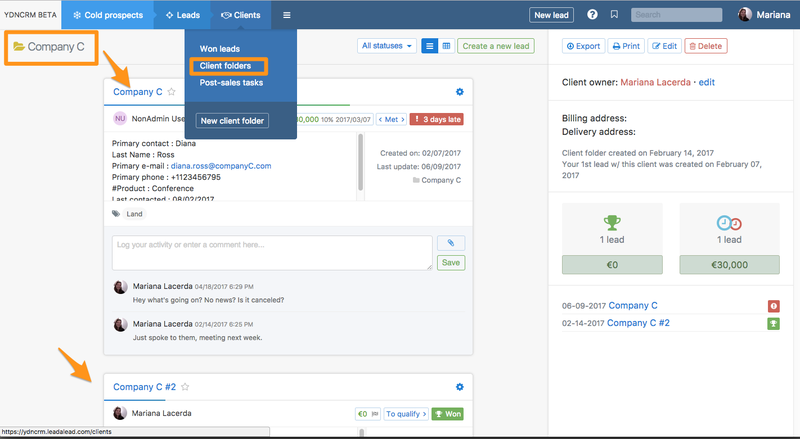 If you have a third lead with the same client and wish to add it to an existing folder, simply click on the Actions button and select Attach to a Client Folder. The system will then suggest that you look for the existing client folder, or to create a brand new one if needed. If you've lost a lead or a customer in the past but you can now you can win them back, simply duplicate the lead! You'll have a client folder with a lost lead, and a new one that you might win this time.